This entry was posted on 1/17/2019 03:30:00 AM and is filed under Alexandria Ocasio-Cortez , DEMOCRATS . You can follow any responses to this entry through the RSS 2.0 feed. You can leave a response, or trackback from your own site. Is this meme based on anything? She's made it pretty clear from her tweets and public statements that she's pretty well versed on economic issues. Republicans are scared of Alexandria Ocasio-Cortez. When was the last time anyone saw Republicans attack a freshman member of Congress this viciously? They're terrified of her, and it's not because they think she's stupid. 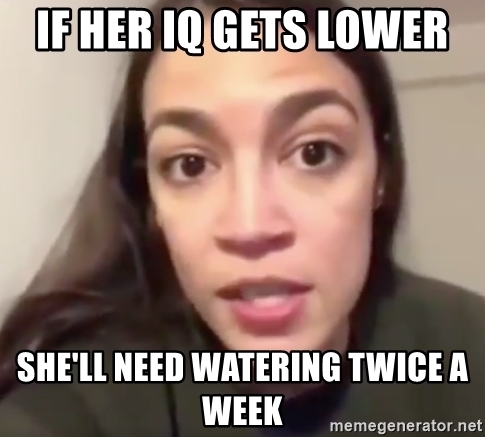 Ocasio-Cortez, Ocasio-Cortez, what a killer. RWD is so "smart" he has to use a "meme generator" spewing stale jokes to do his thinking for him. no science, no examples, no proof of RWD's ability to have better critical thinking skills than AOC. In any case, AOC can/will mop the floor with a RW-er in a policy debate. That's why she scares the bejeezus out of them: She's got the brains to brawl, the gumption to see the fight through...and she'll outlive the ever shrinking contingent of corpoulent aging RW hotheads.